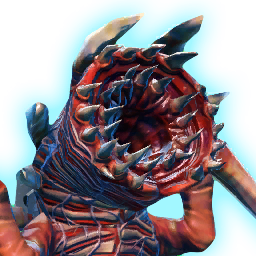 Your creature uses its maw to stun the target for <<1[%d seconds/%d second/%d seconds]>>. Your creature lunges at the target and delivers a powerful bite, dealing <<1>> internal damage and causes the target to become immobilized. Your creature sensing the target's weakend state goes for the heart and stabs at it multiple times, dealing <<1>> internal damage. Can only be used on targets with less than 30% health. Your creature unleashes a mighty cry that dazes the target for up to 10 seconds. Damage to the target causes this effect to end prematurely. Targets may only be affected by Deafening Cry once every 30 seconds. Target must not be suffering from periodic damage and have greater than 90% max health. Your creature projects special digestive juices on the target healing and cleansing it of mental and physical effects for <<1>> for 9 seconds. What an incredible smell! Fires a multi-grapple line from your creature's collar that fires in a wide cone in front of the Klor'slug and pulls the closest three targets and generates a high amount of threat. Only affects targets that are in combat and are not in cover or have Boss Immunity. Your creature strikes at the target and delivers a powerful attack, dealing <<1>> weapon damage, heals for 25% of damage dealt and generates a moderate amount of threat.